Help your community while having fun! We need the following types of volunteers...there's something for all talents and all ages so take a look! January 10-18, 2014 your help is needed every day in multiple ways at Driggs Snowscapes. We accept any and all types of volunteers. See below for specific areas of need or email Kristin Ladd at kyoladd@gmail.com if you have a way you can contribute! We are looking for people who are creative and excited to work with kids and families. This volunteer would run the kids area. We are open to new ideas, or we have some of our own such as creating sculptures with kids, doing educational activities, and working on winter science with the Teton Science Schools. Email Kristin Ladd at kyoladd@gmail.com with "Kids & Family Volunteer" in the subject line with your information, questions, and times available. You can set your own hours and compensation may be available depending on your experience level. Families are welcome! 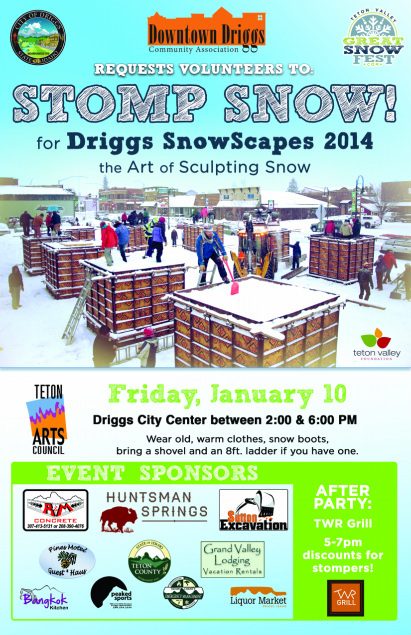 Come Stomp the Snow to get the blocks ready for artists! Fun for the whole family with discounted dinner in town to follow. Email kyoladd@gmail.com with "Stomping Volunteer" as the subject and your names in the email to sign up! Love to take great pictures as a passion or professionally? We need you for sculpting and viewing days! Sign up for any time, any day or several times and several days--you make your schedule. Email kyoladd@gmail.com with "Photographer Volunteer" in the subject line and let us know when you can come photograph the event! Photographs will be used for website, advertising, greeting cards, and other promotional materials. All photographers will be given credit and are eligible for professional support and discounted items in town.